It was very beaufitul day today, so we went to Itado beach to spend good afternoon before going to shopping. While I was playing for snorkeling my son, Yuuki was playing with my wife near the water. But when I came back he took off all clothes because it was very hot today and my wife did it. The water was still very warm here, so I could find many fishes in this area….. This entry was posted in beach, Family, Sea on 2007年9月28日 by izusakuraya. Shirahama Beach is still in a summer!! This month it had been almost cloudy, sometimes rainy and a little sunny until today. But we have gotten sunshine at last today after a long time. A blue sea and blue sky gave us a beutiful day. In addition it was very hot many people were in the water…. 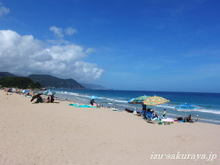 This entry was posted in beach on 2007年9月16日 by izusakuraya. After picking my daughter up at the school we went to the beach today. It was almost 5:00 pm but there were some people swimming in the water. The weather forcast said yesterday, it would be cloudy. But actually we got a sun and it was very hot here in Shirahama. When we were going to come back home we could see a beautiful sunset…. This entry was posted in beach, Family, nature on 2007年9月14日 by izusakuraya. When I finished my job for this morning I went to the beach with my son "Yuuki" to swim. It was cloudy in the morning but it was changed, sunny in the afternoon. I went to Shirahama shrine and leave my car at the parking lot, and got into the beach. This place is behind Shirahama shrine and we can see "Torii" Red gate (?) on big rock. 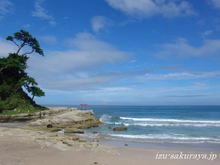 Actually we can go to the another beach "Shirahama Chuou Beach" over that rock by walking…. 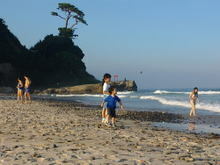 This entry was posted in beach, Family on 2007年9月11日 by izusakuraya. 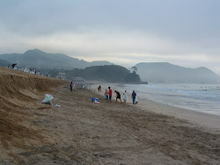 This morning we, the local people of Shirahama area cleaned up the beadch from 6:00 am. I was thinking there would be a lot of trashes on the beach, but actually there was no big trash after all. Probably the typhoon brought them…. This entry was posted in beach on 2007年9月9日 by izusakuraya. 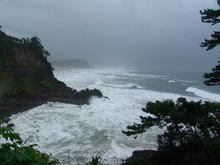 Typhoon #9 coming to Izu peninsula directly!! Long time no posting this weblog, but how have you been? By the way do you know typhoon is coming to Japan this time? Look at this picture which I took this morning!! We usually get a gorgious and blue sea at this point, but as the typhoon is coming directly to Izu peninsula we had strong and dark wave today….. This entry was posted in Sea on 2007年9月6日 by izusakuraya.